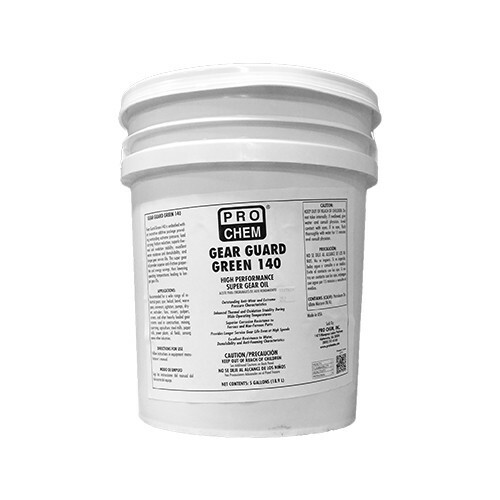 Gear Guard Green 140 | Pro Chem, Inc.
temperatures, while offering superior corrosion resistance to ferrous and non-ferrous parts. This enhanced formula is ideal to use in most circumstances as it is highly resistant to water, and has excellent demulsibility and anti-foaming characteristics. 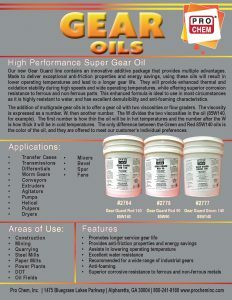 The addition of multigrade gear oils is to offer a gear oil with two viscosities or flow graders. The viscosity is expressed as a number, W, then another number. The W divides the two viscosities in the oil (85W140, for example). The first number is how thin the oil will be in hot temperatures and the number after the W is how thick it will be in cold temperatures. The only difference between the Green and Red 85W140 oils is the color of the oil, and they are offered to meet our customer’s individual preferences. Follow instructions in equipment manufacturer’s manual.